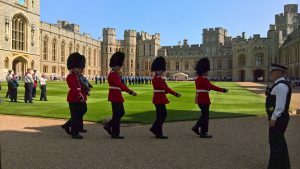 4 Llanidloes Explorers enjoyed a fabulous day at Windsor Castle to join in a parade for those attaining the Queen's Scout Award. They were each spoken to by either Princess Beatrice or Bear Grills. The atmosphere and sights were quite splendid. 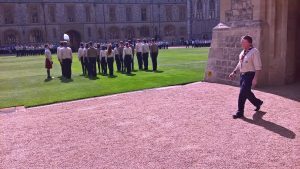 A reflective and celebratory service took place in the chapel. Our lads happened to be two rows from the front. 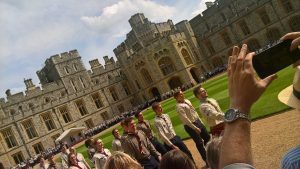 There were only 8 Queen's Scouts from the whole of Wales. 4 from our Montgomeryshire District (and two more in the pipeline, applications awaiting approval). Da iawn ti! The theme of the service reminded us all that we are one piece in a puzzle. 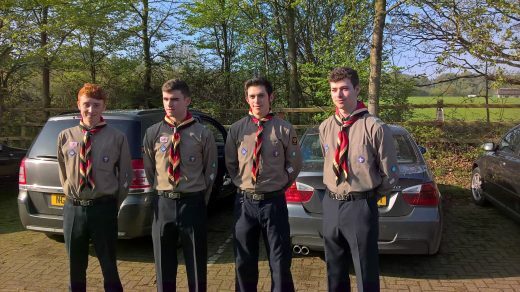 The Scouting movement meant they recognised a few other award holders - Tom's mate from a week volunteering at Gilford, a few from uni and others from Gold D of E at St James'. We can only be grateful to all who volunteer and work hard to keep the Scouting movement alive and so full of possibilities. Congratulations to Tom, Will, Ethan and Jeff. Pob lwc as you take your Scouting achievements towards venture new. Well done to you all.